The recipe for One Bowl Brownies is found on the back of the box for Baker’s® Unsweetened Chocolate … and has been for decades. It is a brainchild of the Baker Chocolate Company, the oldest producer of chocolate in the United States. 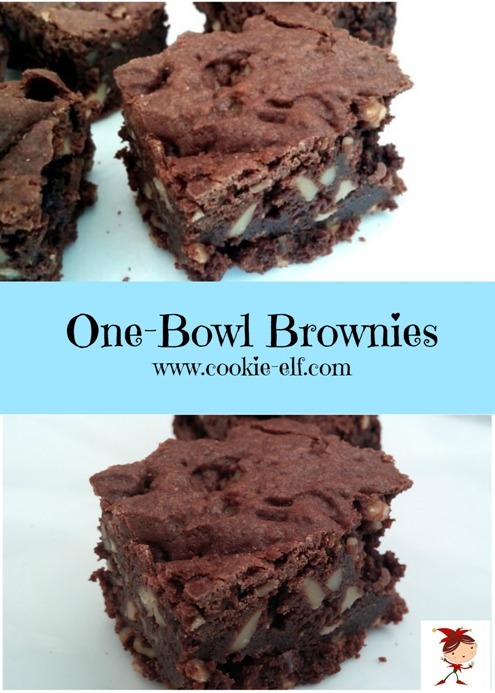 There are several reasons these brownies are so easy to make. Most significantly, the batter can be mixed together in one bowl … hence the recipe name. Also, the recipe calls for just 6 ingredients (7 if you included the optional chopped nuts). You can mix the batter by hand with just a wooden spoon. These brownies come together so quickly that in less than ten minutes, they will be in the oven. But even more than simplicity, many people simply swear by this recipe as the hands-down best brownie recipe ever. Perhaps that’s why it has remained on the package box for so many generations. Heat oven to 350º F (325º F for glass baking dish). Line a 13 x 9-inch baking pan with foil extending over edges to form handles. Grease foil with shortening or vegetable spray. Set chocolate and butter in a large microwavable bowl. Microwave on high for 2 minutes or until butter is melted. Stir the ingredients are smooth, until chocolate is completely melted. Add sugar into chocolate mixture and stir until well blended, then eggs and vanilla until well blended. Stir in flour and nuts. Thin Brownies: Prepare as directed, but bake dough in a 13 x 9 pan for 30-35 minutes. Super Chunk Brownies: Stir in 8 ounces of coarsely chopped chocolate and ½ cup raisins into prepared batter before pouring into prepared pan and baking as directed. Cake-Like Brownies: Stir in ½ cup milk along with the eggs and vanilla, and increase the flour to 1 ½ cups. Extra-Fudgey Brownies: Use 4 eggs in the recipe instead of three. Rocky Road Brownies: during last 5 minutes of baking, top brownie batter with 1 cup miniature marshmallows and 1 cup chocolate chips. Although the original recipe calls for a 13 x 9 pan, you will get thicker brownies if you use an 8- or 9-inch square pan. Bake for about the same amount of time, but be sure to check for done-ness by inserting a toothpick into the brownies to see if fudgey crumbs emerge.